The Clock Panel can show the current time or a countdown and updates every second. Show the time in another office or show a countdown to an important event. Default is time. If countdown is chosen then set the Countdown Deadline to start the countdown. Show time in the 12/24 hour format. Used in conjuction with the mode being set to countdown. Choose a date and time to count down to. The font size, weight and date/time formatting can be customized here. If the seconds ticking annoys you then change the time format to HH:mm for the 24 hour clock or h:mm A for the 12 hour clock, or see the full list of formatting options. 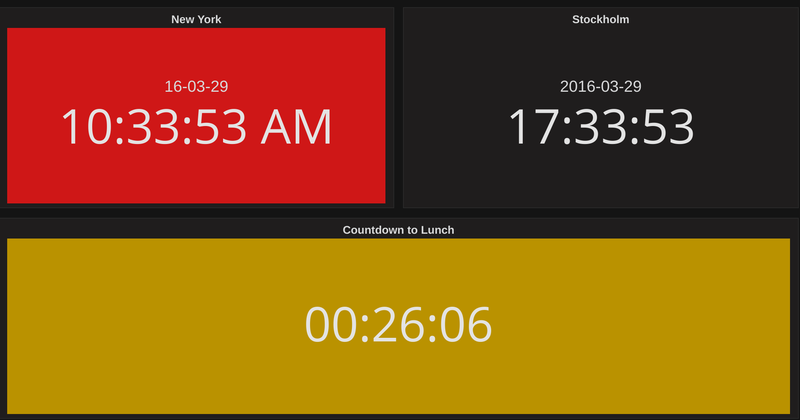 Choose a background color for the clock with the color picker. The clock is paused and only updated when the dashboard refreshes - the clock will show the timestamp for the last refresh. Log in with username "admin" and password "admin"
Dashboard sync/refresh feature - can show timestamp for last dashboard refresh. Tech - converted to TypeScript and Webpack.